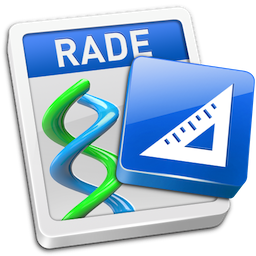 31 December 2012 — Excellent progress continues with the eighteenth Preliminary Release of Helix RADE 6.2 for macOS available today. For those who haven’t joined us yet, you can still participate via the monthly installment plan, for an initial payment of just $320.00, followed by 4 monthly payments of $40.00. Or you can pay $440.00 and get every update we release through May 31, 2013. We’re still committed to monthly releases, so that’s 5 more updates delivered to you automatically. There is also an update to Helix Utility. The next time you launch it, a dialog should automatically offer to install the update. If not, you can choose “Check for Updates…” from the “Helix Utility menu” or copy it from the “Helix Diagnostics” folder in the installer disk image. Every object in the Helix larder is an indispensable part of the whole, but the template is where most of the other pieces are assembled into that part that interacts with the user. For the past few years, making minor structural modifications to a Helix template has been, for some, a monumental undertaking involving finding a reliable way to move the Helix collection between macOS and Classic machines. The optimal arrangement has been to use a G4 or G5 (i.e., a PowerPC-based Mac) running macOS 10.4.11 and Classic. This enabled you to go back and forth between Classic and macOS as easily as moving between Design Mode and User Mode. With that arrangement, there was no need to copy the collection from one machine to another just to see how the changes, made in Classic, appeared in macOS. But time has marched on, and those machines continue to age and die. Repairing or replacing them becomes more and more difficult, and can cost more than it is worth when a new Intel Mac mini can be had for under $600. When we started the Europa Pioneer Plan, we stated that we were not going to put any effort specifically into making the PowerPC code work, but that we would support it for as long as it remained practical. Sadly, as we were testing the new template editor, we discovered that some of the code wasn’t working correctly on PowerPC machines even though it worked perfectly on an Intel Mac and, practically speaking, fixing those bugs would set us back at least a week. Our target dates for completing RADE don’t allow for detours, so we’ve made the hard decision to no longer support the PowerPC version of Helix RADE. Preliminary Release 18 finally, mercifully, begins to close the door on that era, being the first release that we are delivering as an Intel only application. But we’ve left the door open just a crack: if you don’t mind a few limitations and possible “why doesn’t this work?” moments, you can continue to use Helix RADE on a PowerPC Mac by downloading the Preliminary Release 18 from the Interim Builds page, where the Universal version can be found. Before delving too deeply into the finer details of what we’re giving you today, let’s frame our discussion of the macOS template like this: it is being implemented in four phases. In the first phase, last month, we showed you what the template looked like and hinted at how the Inspector would be involved in its use. The second phase begins today, with what we call the“The Very Much Usable Template.” This template now allows you to do almost everything the template needs to do, all without having to rely on AppleScript. Some capabilities remain limited for the time being, specifically those involving the mouse. But the vast majority of the template editing actions can now be accomplished via the Inspector and/or the keyboard. The third phase will most likely play out between now and the middle of January, in Preliminary Release 19. In that iteration, the mouse functions will be implemented and the remaining “critical” functions will be completed. At that point, we are going to set the template aside and shift our focus to the abacus. The fourth and final phase of template work — the little touches that make editing templates easier — is being postponed until after the abacus and user editors are done. Everything Helix RADE 6.2 does was, to some degree, recreated for macOS, and generally the first rule of the new order was to enable AppleScript to do it. This required the establishment of some nominal conventions that, once created, would apply consistently to putting the same function under the control of the Inspector and eventually of the keyboard and mouse. On a very fundamental level, building and/or remodeling a Helix template requires the ability to create rectangles of several different types, to populate a data rectangle with a field, an abacus or both, to change the content of any rectangle, to place informative labels on the template and to remove one or more rectangles when necessary. Template rectangles also have many properties that need to be adjusted: printability, visibility, font, background color, etc. With the principal goals of making the template easier to understand and use, many of the assumptions about how templates are edited had to be set aside for macOS. Our “prime directive” was to bring all the relevant commands and controls together in a logical fashion. When you look critically at the Classic interface, you find that there are things were not necessarily coherent. Helix’s ‘evolution’ can be seen in the way new features were ‘bolted on’ without ever revising what had come before. Settings that really had nothing to do with each other appeared in dialogs together. Some settings were in the √ menu, while others were tucked away in other menus. Some items were only available by double clicking a rectangle and then clicking an ‘Options’ button to access a second level of dialogs. Having everything you need in a single location — the Inspector — eliminates this game of hide and seek and, to some users, will reveal features they never knew existed. Consider how you remove a rectangle from a template. Some of you may recall that once upon a time, this could only be done by clicking a little gray box in the lower right corner of the selected rectangle, holding down the mouse button and dragging up (or to the left) until the rectangle disappeared. And if you only meant to resize the rectangle, but went a bit too far, well, sorry. Eventually, dragging was joined by the “Command-delete” keypress, but that was available only through the keyboard. There was still no menu item you could choose to delete a rectangle; you simply had to know about it. We realized this shortly after the ability to delete by dragging was removed, and users started calling to tell us removing rectangles was broken. The emphasis in RADE 6.2 is for all commands to behave simply and logically. If there is a function you access with the keyboard, it should also be on a menu. (And the menu should show the keyboard shortcut so users can learn the shortcuts instead of playing a guessing game.) For the most part we’ve put these commands in the “Icon” menu, although a few are found in the “Edit” menu, when that makes more sense. A couple of months ago, we introduced the Element Panel as the replacement for the ‘slot machine’ switches that appear on the left side of every Helix editor window. This logically extends to the template editor, and so the tools you needed to edit a template are found there. Whenever a template is selected, the Element Panel switches to show the tools you need. In Preliminary Release 18, the Element Panel also shows the lists of icons that can be used on the template. But those lists aren’t actually hooked up yet, so for right now they are just for show. Our next project is to enable dragging from the Element Panel (and other windows) as a means of adding icons to rectangles. For this release, you choose the icons from the popup lists found in the Inspector. During the course of implementing the template editor in macOS, we thought hard about not just what had to be done, but also how to do those things most efficiently, while still maintaining familiarity with the Classic way of doing things. Our goal is to make it familiar, but better. The first thing that will grab your eye when you open a template is that the Classic template’s “dotted” background — which was referred to as “graph paper” even though it didn’t look like graph paper — has been updated to a true graph paper background. The first illustration on the right shows what it looks like by default in macOS RADE. But here’s where it gets really exciting: we’ve made the size of the graph paper adjustable through the horizontal and vertical spacing properties in the Inspector. The second illustration on the right shows the same template with the graph paper settings changed. This makes it easy to create a series of perfectly sized rectangles without squinting and counting dots, as we had to do in the olden days. Using the mouse to draw a new rectangle works as it has always worked — and we’ll add moving and resizing by mouse next month — but if you were in the habit of using the arrow keys to move and resize rectangles on the template, you’re in for a mixed bag of blessings and adjustments. We’ve added some new ways to move and resize rectangles via the keyboard, so there’s going to be a period of adjustment if you’ve got the old key combinations burned into your brain. But we’ve been working with them for a couple of weeks and they are already starting to feel very natural — more natural than the Classic key combinations even. Resizing a rectangle is accomplished by adding the Command key, so that ‘Command-left arrow’ moves the right edge of the rectangle, making it narrower; and ‘Command-right arrow’ makes it wider. The up and down arrow keys do the same thing with the bottom edge of the rectangle. But perhaps coolest of all is that you can now add the Control key to resize rectangles, from the left side and top edge, giving you unprecedented control. Lastly, if you find that the “Align to grid” setting is not the way you need it to be, don’t grab the mouse for a trip to the Inspector. Just add the Option key and the “Align to grid” setting is temporarily reversed. Another great new capability of the new template editor is when you hold down the Option key, the “Select All Rectangles” command (on the ‘Icon’ menu) becomes “Select Similar Rectangles,” so you can now select just one rectangle on the template and with a single menu selection (or keystroke) select every rectangle of that same type. So, for example, if you want to enlarge the text labels on a template, you can now easily select them all, regardless of where they are on the template. Did you catch what we just said: you can now resize multiple rectangles together! This is a feature that fills us here at QSA ToolWorks with sheer delight. The days of “click, resize, click, resize” etc. to change a dozen rectangles are over! And like they say on Madison Avenue, there’s more! In Classic, if you placed an icon and then resized the rectangle, you could sometimes completely hide the icon from view. Now, icons are automatically positioned so you can always see at least the name. If if an entry rectangle contains both a field and abacus icon, they are arranged side by side, so they won’t overlap (unless the rectangle is very small, that is). And that new capability is important because now, for the first time ever, you can edit an icon directly from within a rectangle! Click on an icon in a rectangle, and the Inspector shifts its focus to that icon. You can edit the properties of that icon or, if it is of a type that has an editor window, double click it to open its editor. Of course you can also open the icon’s “Where Used” window, and all of this works with the mouse or through menu commands and keyboard shortcuts. As you can see, there are lots of things to explore in Helix’s new template editor. We’ve covered quite a few, but you should take time to read the complete story on the Preliminary Release 18 Release Notes page and to watch the video we put together (on the right) that shows off the newest tricks. One final note: if you are wondering about the Classic ruler feature that provided a guideline as to the relative position on the printed page of the various objects, we’re sad to report that it has been retired for now. We may bring it back in the future, depending on how many people write to tell us they can’t live without it. Something else, or as they might say out near Jupiter’s moon Europa, “something wonderful,” also happened during this cycle. Two somethings, actually. First we gathered up the bug fixes and improvements that had accumulated since the last release of Helix Utility and put them together in an update that is also available today. This is the first test of our new ‘Sparkle’ code, and if all goes well, the next time you launch your old copy of Helix Utility, it will automatically prompt you to download it. (if not, choose Check for Updates from the Helix Utility menu to get it.) The changes are noted in the update prompt, and also on the Preliminary Release 18 Release Notes page. Second: Although we stopped active development of the Helix 6.1.x line after the release of 6.1.10, we knew there were still some besetting issues that were driving some Helix Client users to the point of distraction. One of our customers even offered a bounty on the ones that were affecting him the worst. And so, for more than a year now, we have been chipping away in our ‘spare time,’ revising the Client/Server code in an attempt to fix these problems — and to collect the bounty! This was, for us, the best possible scenario: all of our disruptive work is being done in 6.2, so working in the 6.1 code gave us a stable platform to experiment with Client/Server changes. We were able to ‘try this and that’ with very little pressure until, of course, we found solutions to the problems. Once we collected the bounty (meaning that we’ve made one customer very happy) we decided that the improvements were significant enough to warrant yet another new release of 6.1.x. 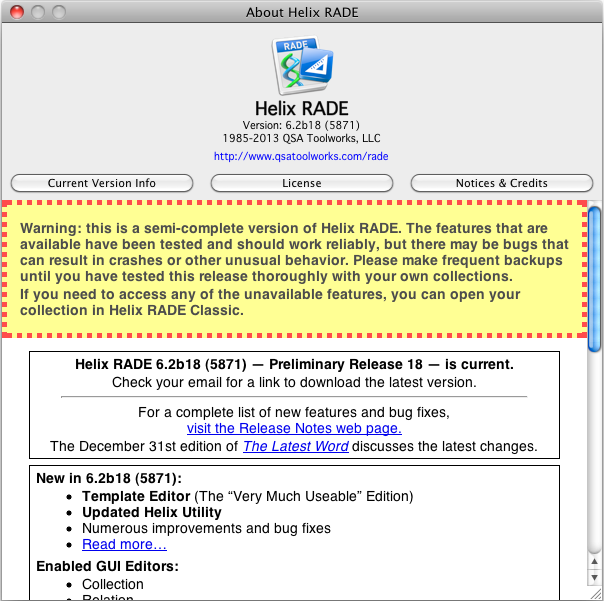 And so, along with Helix RADE 6.2 Preliminary Release 19, Helix Client/Server 6.1.11 is also available on the downloads page. You can read about the changes on the Helix 6.1.11 Release Notes page. These fixes make Client/Server faster in some situations and more stable in general, and are easily brought forward to Helix Client/Server 6.2, which will be all the better for it. But, in keeping with our “end of the PowerPC era” theme, this update is not being made available in a “for PowerPC” version for Helix 6.0 licensees. All of the previous 6.1 releases were available in a ‘PowerPC-only’ form, but if you have never actually purchased the 6.1 upgrade, you won’t be able to install this new version. Considering that Apple hasn’t made a PowerPC Mac in over six years, it’s time to close the book on that chapter. The first Intel-native, Client/Server 6.1 upgrade shipped over 4 years ago — and anybody who has purchased the 6.1 upgrade at any point along the way can update to 6.1.11 at no charge whatsoever. If you are one of the holdouts and you haven’t upgraded your Client/Server license to version 6.1, it’s time to step up. We could really use your support. The Client is ‘Universal’ meaning it will run in macOS on both Intel and PowerPC Macs, and we also created a Classic Client that is compatible with Helix Server 6.1.11. So those old PowerPC Macs that are still kicking don’t have to be put out to pasture, if you aren’t quite ready to replace them. Two primary pieces of the Helix RADE Design Mode puzzle remain to be completed and will be the focus of the remainder of the Europa Pioneer program. The first is the abacus. The abacus will look a bit more modern, but its functionality is expected to remain the same. What the abacus does in Helix is still so far ahead of its time that there is little reason to overhaul it. That said, however, we will always be looking for ways to enhance the abacus and make it even easier to use. When the abacus is done, we’ll tackle the final piece: the user editor. The new user editor will, unlike the abacus, emerge from this process with a new design. We have already done quite a bit of work on the design of the new user editor, so we expect the work to go fairly quickly. Finally, as always, please don’t forget that we still need all the financial help we can get to finish this job. It won’t be long before we all finally get back to doing what we love to do the most: dreaming up and building new capabilities into Helix. Thank you all for hanging on. We made incredible progress in 2012 and we expect 2013 to be even better. Happy New Year!